Cut it, Create it, Show it! Cut it, create it; show it! With the Cutie Stix Cut & Create Station, you can create customizable jewelry, nail art, and fun figures out of colorful two-sided beads. 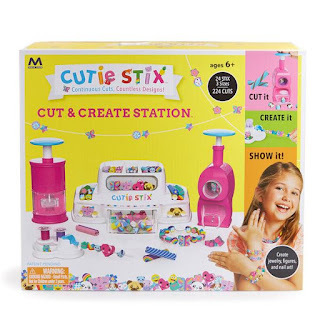 Using the Cut & Create station is easy and fun; you simply choose your Cutie Stix design, cut it, and core out the center to make fashionable beads for your bracelets, or necklaces. The combinations are endless! Owls, pandas, foxes, so cute! 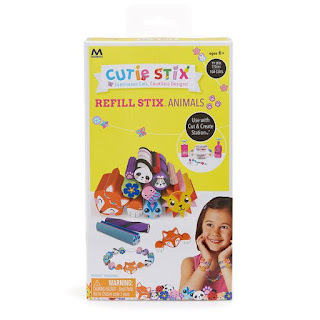 The fun of customizing your Cutie Stix creations never ends with the Animal Refill Stix Assortment. You can create customizable jewelry, nail art, and fun figures out of colorful two-sided beads. The set comes with an assortment of mightie, cutie, and teenie sized stix to refill your favorite set and continue the play! The refill stix assortment is to be used with the Cut & Create Station. Rainbows, unicorns, emojis, oh my! The fun of customizing your Cutie Stix creations never ends with the Emoji Refill Stix Assortment. The set comes with an assortment of mightie, cutie, and teenie sized stix to refill your favorite set and continue the play! The refill stix assortment is to be used with the Cut & Create Station. Cupcakes, hamburgers pinneapples, galore! 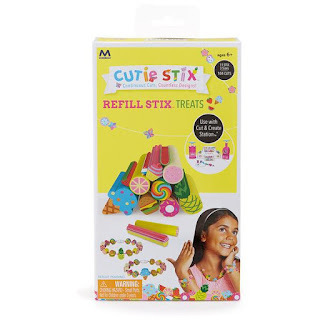 The fun of customizing your Cutie Stix creations never ends with the Treats Refill Stix Assortment. You can create customizable jewelry, nail art, and fun figures out of colorful two-sided beads. The set comes with an assortment of mightie, cutie, and teenie sized stix to refill your favorite set and continue the play! The refill stix assortment is to be used with the Cut & Create Station. Cutie Stix are an absolute blast! 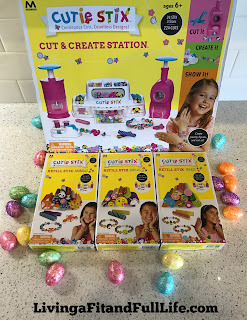 I have 3 girls age 9, 6 and 4 and they had so much fun getting creative with Cutie Stix. 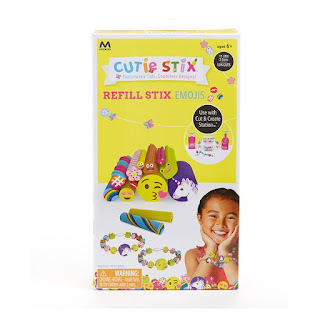 With the Cutie Stix Cut & Create Station kids can can create customizable jewelry, nail art, and fun figures out of colorful two-sided beads. The beads are incredibly adorable and you can even purchase Refill Stix such as treats, emojis and animals to add even more fun. My girls found Cutie Stix incredibly easy to use and absolutely love their creations. Cutie Stix Would make a terrific gift this Easter and would look adorable in any Easter Basket! Click HERE to learn more about Cutie Stix! Follow Cutie Stix on social media!